An incredibly long time ago, the entry-level Boxster was the best selling car in Porsche's entire lineup. The problem was that the wee little roadster wasn't generating the profits that Porsche needed to lay the groundwork for a successful future. That's why Porsche performed the most heinous act in the history of purebred sports car makers: They introduced the Cayenne SUV. Porsche purists threatened to jump from rooftops and 911 owners refused to acknowledge the Cayenne's existence. But that didn't stop the truck from becoming a massive success. 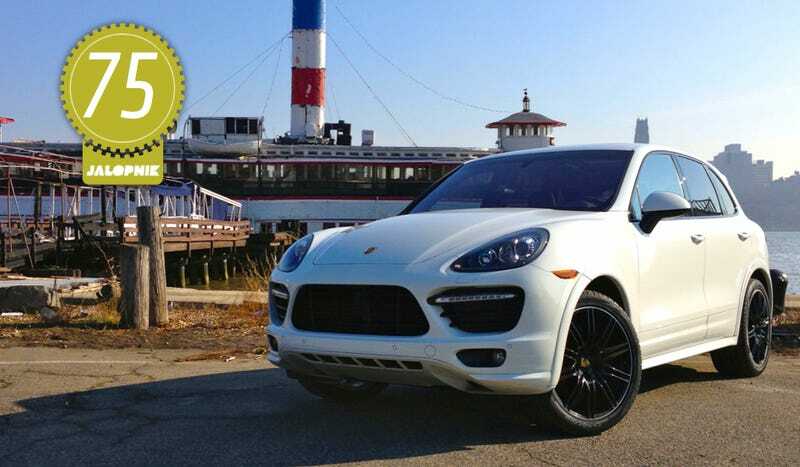 And now we have the second generation Cayenne GTS, the split personality SUV for the person that wants a sports car but also needs to take the kids to soccer practice. It's a brilliant truck, but is it also a brilliant Porsche? In one way the GTS is the 911 GT3 of the Cayenne family. In another, more accurate way, it isn't really close. The GTS gets the most powerful naturally aspirated V8, the most aggressive suspension setup, and the fastest shifting automatic gearbox in the lineup. That makes it GT3-ish. It's also a truck. That makes it not GT3-ish. Porsche's intent is for the GTS to be the sportiest Cayenne you can buy today. It marries on-road dynamics with off-road ability, though if you ever see one off-road it's probably because someone flipped it off the road and into a ditch. The first generation Cayenne looked a bit like Porsche took a 911, put it in Photoshop, and stretched every dimension to create an SUV. It was awkward. The second generation car tones down that stretched 911 styling to make it go in its own direction. The restyled car looks smaller and more aggressive, but the gaping maw is a little much for my tastes. There are also bulges all over the place that seem to be trying to convince the outsider that it's sporty. "I really am sporty, y'know! I have flared fenders. My hood has a powerdome!" The Cayenne continues the new Porsche tradition of covering the entire interior with buttons. The center console has buttons and switches for everything. I mean everything. It can be confusing at first, but once you get used to it it's actually intuitive and easier to operate than an iDrive. The suede covered seats are truly excellent. They're comfortable and very well bolstered. The car I drove didn't have Porsche 18 way adjustable seats. Instead, it just had adjustable lumbar. That's it. Most surfaces like the seats, roofliner, and steering wheel are covered in Alcantara, that ever so lovely sueded material that I can't keep my hands off of. It also has a simply gigantic panoramic roof, which I'm indifferent about. Sure, it lets in tons of light, but it also reduces stiffness. The GTS is supposed to be the sportiest Cayenne. Doesn't cutting a giant hole in the roof work against that that whole "sporty" thing? I think so. You might think that the Cayenne is a bit of a heavy ride. And you'd be totally right. At 4,597 pounds, the GTS isn't a featherweight. It's also 44 pounds heavier, not lighter, than the Cayenne S, which is a less sporty variant. Thankfully the GTS shifts faster than the other Cayennes thanks to some techno wizardry in the eight speed gearbox. A higher output 420 horsepower version of Porsche's 4.8-liter V8 doesn't hurt either. Porsche says the GTS sprints to 60 in 5.4 seconds, and I think that's a conservative number. If you want to accelerate while at speed, the GTS will drop down a handful of gears like a boss and then sprint up to your desired speed. I wasn't expecting the $17,000 price premium would make the GTS considerably faster than the Cayenne S, and it isn't, but it is at least marginally quicker. The Cayenne GTS has 14.2-inch discs in the front with 13-inch discs in the rear. They haul the truck down from speed pretty nicely. The pedal is solid and feels pretty good. I did wish for a bit more initial bite. I also felt they were a slightly outclassed by the weight of the Cayenne at high speeds. Then again, if someone takes the GTS to the track, they need to reconsider what they buy for a track car. The GTS gets the most aggressive suspension setup of the entire Cayenne range. Porsche has tuned the ride to be pretty stiff in normal mode. A stab at the sport button lowers the air suspension and really stiffens up the ride. We're talking 911 levels of stiffness here. The steering also gets weightier (that's a fun way to say heavier), which is a nice touch. I tended to put it in sport a lot. On the highway in normal mode, the steering is nice and light and the suspension is super compliant. It's a great cruiser. In terms of SUV handling, this thing gets a 17 out of 10. I have never, ever driven a truck that handles like the Cayenne. There are two decreasing radius two lane on-ramps that I frequently drive on to get to the highway. This is my normal opportunity to pass a whole gaggle of cars around the outside that have drivers that aren't sure what handling is. I didn't think the Cayenne would be any good here. I was so wrong. The freaking truck was so planted around these corners. It also instilled more confidence than many performance cars I drive. Seriously. The GTS is on another planet when compared to other SUVs. The Cayenne is so poised through the twisties that you'll totally forget that you're driving an SUV, which can be dangerous. Body roll is minimal and grip is plentiful. Honestly, the tires (my test car had Pirelli winter rubber on board) are what let it down. I could have driven it faster, but that's when the achilles heel would arise: exceeding the Cayenne's limits. No matter what you are told, this is still a heavy, tall truck. If you turn off the nannies and something goes wrong, it'll go very wrong. I was initially disappointed with the eight-speed box in the GTS. I was longing for my beloved friend, PDK. But over time I realized that PDK just wouldn't be suited to the Cayenne at all. The auto box is smoother and more forgiving. It's also better for fuel economy. In sport, it did return very quick, PDK-esque shifts and downshifts were also fast and rev matched. My qualm is that there is only one Cayenne where PDK would be appropriate, and it is the GTS. I did come to appreciate just how smooth and fast the eight-speed auto was, but I still prefer PDK. Porsche's 4.8-liter V8 is one of the great engines of our times. Open up that exhaust baffle and it creates a chorus that can rival anything out there. It's just guttural and angry, like a swarm of Africanized killer bees stuck inside an angry grizzly bear which, in turn, is stuck inside a dryer. I can't tell you how much I love it. On the radio front, we have Porsche's Burmester audio system. It's another audio masterpiece. Problem is that it's a $5,700 option. That's just insanity. We're well stocked for toys here. Adjustable ride, active exhausts, an air suspension with five settings, great stereo, parking sensors, active cruise control, a collision avoidance system, keyless start, and all the other doo dads you'd expect. The GTS starts at $82,050. That seems like a steal! Wait, you want a suede steering wheel? That's $290. Want satellite radio? That's $1,120. Navigation? $3,675. The car I drove was $124,875. That means it had, ahem, $42,825 in options. Holy crap. I have no doubt that the Cayenne GTS is absolutely superb to drive. It's the first SUV I've driven that I could see myself owning. And if you're in the market for a Porsche SUV, it's the one to get. Just don't go crazy on the options sheet.